David Michael Hasselhoff (born July 17, 1952), nicknamed "The Hoff", is an American actor, singer, producer, and businessman. He has set multiple Guinness World Records, being the most watched man on TV and having the highest reverse bungee jump. He first gained recognition on The Young and The Restless, playing Dr. Snapper Foster. His career continued with his leading role as Michael Knight on Knight Rider and as L.A. County Lifeguard Mitch Buchannon in the series Baywatch. Hasselhoff produced Baywatch from the 1990s until 2001, when the series ended with Baywatch Hawaii. On screen, he appeared in films including Click, Dodgeball, The SpongeBob SquarePants Movie and Hop. In 2000, he made his Broadway debut in the musical Jekyll & Hyde. Following his debut he starred in other musicals including Chicago and The Producers. Hasselhoff was born in Baltimore, Maryland, the son of Dolores Therese (née Mullinex/Mullinix; died February 11, 2009), a homemaker, and Joseph Vincent Hasselhoff, a business executive. His family is Roman Catholic, of German, Irish and English descent. His great-great-grandmother, Meta, emigrated with her family to Baltimore from Völkersen, Germany, 30 kilometres (19 mi) from Bremen, in 1865. He spent his pre-teen years in Jacksonville, Florida, and later lived in Atlanta, Georgia, where he attended Marist High School. Hasselhoff made his theatrical debut at age seven in Peter Pan, and ever since his childhood dream was to have a career on Broadway. He graduated from Lyons Township High School in La Grange, Illinois in 1970. He was a member of the speech team, senior discussion leaders, president of the choir, captain of the volleyball team and held roles in several plays (including one lead role as Matt in The Fantasticks). He studied at Oakland University before graduating with a degree in theater at the California Institute of the Arts. Hasselhoff portrayed Dr. "Snapper Foster" on The Young and the Restless from 1975–82, leaving the series as the show wrote out many of their original characters. In 1979, he played "Simon" in Starcrash. He launched his singing career with guest appearances on the first season of children's program Kids Incorporated, performing "Do You Love Me". He guest starred on two episodes of Diff'rent Strokes and the soap opera Santa Barbara as himself in 1984. He describes the acting he has done as "a little more difficult than if you had a regularly well-written script – like, if I was going to be in, say, Reservoir Dogs, or The Godfather, or Dances with Wolves or Lawrence of Arabia or ER, I had to talk to a car." His role in the show led him to a People's Choice Award for 'Most Popular Actor'. Now, over 33 years later, the show is still playing throughout the world. While his star status waxed and waned in the USA, his popularity endured longer in Germany to the end of the 1980s. In 1989, David trained with Patsy Swayze at Debbie Reynolds' Studio in North Hollywood for the Austrian segment of his Knight Rider tour. Hasselhoff returned to television on Baywatch which premiered in 1989. Although it was canceled after only one season, he believed the series had potential, so Hasselhoff revived it for the first-run syndication market in 1991, investing his own money and additionally functioning as executive producer. His contract stipulated royalties to be paid to him from the rerun profits, which gave him the financial liberty to buy back the rights to Baywatch from NBC. In its second incarnation, Baywatch was much more successful. It ran for a total of 11 years and, from the 1990s until its series finale in 2001, was watched by almost 1 billion viewers across 140 countries, solidifying his status among the world's foremost television personalities of the said period. This success combined with his royalties and his other ventures have placed Hasselhoff's fortune at more than $100 million. In 1991, Hasselhoff reprised his role as Michael Knight in the television film Knight Rider 2000 as a sequel to the original series. The movie served as a pilot for a proposed new series, but despite high ratings, the plan was abandoned. In 1996, Hasselhoff was given a star on the Hollywood Walk of Fame. In 1997, he performed a duet with Filipino singer Regine Velasquez, which was used as the main theme for his 1998 movie Legacy. He made his Broadway debut in 2000 in the title role of Jekyll & Hyde. In August 2001, he hosted an event at the Conga Room, in Los Angeles honoring the Latin rock band Renegade for record sales in excess of 30 million units worldwide, taking the stage with the Latin rockers and singing in Spanish. Beginning on July 16, 2004, he played the lead role in London performances of Chicago for three months. Hasselhoff has made several self-parodic appearances in movies. He had a major role in The SpongeBob SquarePants Movie, released November 19, 2004, starring as himself (though resembling his bygone Baywatch character) and meeting SpongeBob and Patrick (his full name is heard once in the movie; he is referred to as "Hasselhoff"). Hasselhoff also had another short appearance in the movie DodgeBall: A True Underdog Story as the dodgeball coach to the German national dodgeball team, Team Hasselhoff. Berating his team after being eliminated from a tournament, he shouts "Ihr seid alle Schweine!" (translated: "You are all pigs! ", a common German insult) and smashes a photo of himself in his Baywatch attire. In 2004's EuroTrip, Hasselhoff appears in a washroom. In the 2006 Adam Sandler film Click Hasselhoff portrays Sandler's despicable boss. Hasselhoff also appeares in an episode of Wildboyz. In 2007, he again played himself in the Jamie Kennedy comedy Kickin' It Old Skool. In his music video for "Jump in My Car", he engages in self-parody; this time parodying his performance as Michael Knight in Knight Rider. The car in the video was a black Pontiac Trans Am with a pulsing LED and an interior nearly identical to that of the KITT car in the series. The video was shot in Sydney, Australia using a right-hand drive KITT replica, including KITT's ejection seat system. In November 2006, Mel Brooks announced Hasselhoff would portray Roger DeBris, the director of the Nazi musical Springtime for Hitler, in the Las Vegas production of The Producers. In 2006, Hasselhoff, became a co-judge on NBC's America's Got Talent, a show that showcases America's best amateur entertainers. He also judged in the second, third and fourth seasons alongside Sharon Osbourne and Piers Morgan. On the 2007 season finale, Hasselhoff sang "This is the Moment." He was replaced by comedian Howie Mandel for season five. Hasselhoff produced Baywatch for first run syndication. He has spoken at both the Oxford and Cambridge Student Unions. He was a celebrity cast member on the eleventh season of Dancing with the Stars which increased in ratings by 36% from the previous year, and served as a judge on NBC's America's Got Talent from 2006-09. In 2011, he joined the Britain's Got Talent judging panel, replacing Simon Cowell. Hasselhoff was later honored on Comedy Central's The Comedy Central Roast of David Hasselhoff in addition to receiving the International Star of the Year Award for Outstanding Contribution to Global Entertainment by the Bollywood Awards. He was awarded the Comeback Star of the Year award during the VH1 Big in '06 Awards. 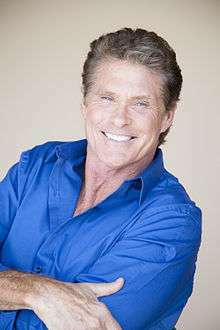 In 2008, Hasselhoff was a featured guest in a Volkswagen commercial, where he talked about the company selling more cars in Europe and the rest of the world than any other brand. In response, the black Beetle commented that Hasselhoff is "not so big" in Brazil. In late October of that same year, Hasselhoff played a bit part in the EA real time strategy video game Command & Conquer: Red Alert 3 as vice president of the United States, while starring in its promotional microsite, conquerthislife.com, which featured several tongue-in-cheek videos as well as a Hasselhoff soundboard. In February 2008, towards the end of the Knight Rider 2008, he reprised his career-making role as Michael Knight as he walked on to introduce himself to his on-screen son, Mike Traceur. On November 12, 2008, he became the first celebrity downloadable character for the PlayStation Network's video game Pain. In September 2009, he featured on a radio podcast for Compare the Meerkat, part of the advertising for British website, Comparethemarket.com. He was the subject of an Early Day Motion in the House of Commons of the United Kingdom as a result of his support for the re-opening of Morecambe Winter Gardens. In 2010, Hasselhoff guest hosted professional wrestling's WWE Raw in London, England. On August 15, 2010, Comedy Central aired a special "roast" of Hasselhoff. Hasselhoff returned to The Young and the Restless, reprising his role as "Snapper" for a short arc that aired in mid-June 2010. Hasselhoff appeared as a contestant on season 11 of Dancing with the Stars. His professional dance partner was Kym Johnson. On September 21, 2010, they were the first couple eliminated from the competition. Coincidentally, Hasselhoff competed against Brandy Norwood, who judged alongside him in the first season of America's Got Talent. In October 2010, it was announced that he would be playing Captain Hook in the New Wimbledon Theatre production of the pantomime "Peter Pan" from December 2010 to January 2011. He has reprised his role of "Hoff the Hook" for 2012 at the Opera House, Manchester. In 2011, he was a guest judge at the Belgian Idols competition. Hasselhoff became a judge on Britain's Got Talent in 2011 alongside Amanda Holden, Michael McIntyre and Simon Cowell. However, Hasselhoff was axed after only one series on the show. In 2011, he revived his music career with a short tour across Germany, Austria and Switzerland. In the same year, Hasselhoff is featured in the trailer of the spin-off downloadable game, Burnout Crash!. On October 1, 2011, David Hasselhoff attended Knightcon 2011 at Xscape, Castleford, UK, with girlfriend Hayley Roberts. The event was also attended by former Knight Rider cohorts Rebecca Holden (April Curtis in Season 2), Peter Parros (Reginald Cornilius III (RC3) in Season 4), and Michael Scheffe, the designer of KITT. In 2012, he was a contestant on The Celebrity Apprentice Australia . He appeared on '8 out of 10 Cats' on May 11, 2012, and entertained the audience by using the word 'willy'. On February 24, 2014 he opened his own 10-week talk show in Sweden on TV3, in English. A similar show was later recorded in Finland, premiering on Sub on April 2, 2015. On New Year's Eve he performed again at the Brandenburg Gate, arriving late because his plane was diverted to Hannover. Hasselhoff had a major role in Sharknado 3: Oh Hell No! which premiered globally on July 22, 2015. He then starred in a new musical, Last Night a DJ Saved My Life at the Blackpool Opera House, late in 2015. On April 21, 2006, fans of David Hasselhoff launched a tongue-in-cheek website "Get Hasselhoff to Number 1" in an attempt to get the 1989 hit "Looking for Freedom" to the top of the UK music charts through Internet downloads of the single. The campaign attracted attention on British radio and television broadcasts, in the national press and on the Internet. Over 40,000 people signed up to receive the "Hoff Alert" e-mail when the time had come to purchase the single. The focus of the campaign shifted to "Jump in My Car", when that was actually released as a single, and BBC Radio 1 DJ Scott Mills lent his support. On October 3, 2006, "the Hoff Alert" was sent out, and Hasselhoff promptly gained his highest ever UK chart entry (number 3) on October 8, 2006. Hasselhoff has launched a MySpace-like social networking site, known as "HoffSpace." He did so in part as a response to people opening false social-networking pages in his name, as well as those of his children. Hasselhoff and his daughters, Taylor-Ann and Hayley, starred in a reality series on A&E called The Hasselhoffs. The series launched on Sunday, December 5, 2010, and focused on Hasselhoff's attempts to resuscitate his career and launch his daughters onto the Hollywood stage. On Friday, December 10, 2010, A&E confirmed in a statement that, after airing just two episodes, The Hasselhoffs had been canceled. According to Nielsen Co. ratings, the first episode was seen by 718,000 viewers. Viewers dropped to 505,000 for the second installment, which aired on the same evening. The full series aired in the UK on May 30, 2011 on The Biography Channel. Hasselhoff stars in a casino-style game series online, produced in partnership with Eric Bischoff with Europe being among the first markets to roll out the game. In keeping with internet and online gambling culture in the UK, "The Hoff" series of games includes video slots and scratch-card type games, all played for real money in Europe's online casino environment. The first in the series of games launched on Valentine's Day in early March, 2013, with media and promotional activities commencing in early February. In 2014 UK channel Dave announced that it had commissioned Hoff the Record, a sitcom series in which Hasselhoff plays a fictionalized version of himself. The series started airing on 18 June 2015. His music career took off in the late 1980s and achieved success at the tops of the charts, with his album "Looking for freedom" which went triple platinum in Europe. He had one #1 hit in the German pop charts in 1989 ("Looking for Freedom"). He was noted for his performance of the single at the Berlin Wall on New Year's Eve 1989, days after the collapse of the wall. Wearing a piano-keyboard tie and a leather jacket covered in motion lights, Hasselhoff stood in a bucket crane and performed the song along with the crowd. The performance has had a lasting impact on German pop-culture with Hasselhoff commenting that the song became an "anthem" and "song of hope" for the people of East Germany. In 2004, Hasselhoff lamented the lack of a photo of him in the Checkpoint Charlie Museum in Berlin. In 1993, he released the single 'Pingu Dance' based on the popular children's show 'Pingu'. In 1994, he was scheduled to perform a concert on pay-per-view from Atlantic City. The concert was expected to help reignite his singing career in the United States. However, on the night of the concert, O. J. Simpson was involved in a police chase in southern California. Viewership of the concert was significantly lower than expected due to the live coverage of the chase, and the event was ultimately a $1.5 million loss. In May 2006, Hasselhoff returned to the spotlight after he was mentioned in an interview of Dirk Nowitzki, an NBA star playing for the Dallas Mavericks and a native of Germany. Nowitzki was asked what he does to concentrate when shooting foul shots. Dirk replied that he sings "Looking for Freedom" to himself. He meant this as a joke but it was thought to be a serious answer. Shortly thereafter, Hasselhoff attended the May 26, 2006, Mavericks home playoff game where they faced the Phoenix Suns in the NBA Western Conference Finals. Interviewed by Craig Sager, Hasselhoff stated he was as much a fan of Nowitzki as Nowitzki was a fan of him. In The 2006 NBA Finals, fans of the Miami Heat in the American Airlines Arena held up facial photos of Hasselhoff and chanted his name when Nowitzki went to the foul line. On August 2, 2006, he proclaimed himself "King of the Internet" in a tongue-in-cheek advertisement for Pipex. In December 2008, he sang the national anthem at the NCAA Las Vegas Bowl. Although the game was televised live by ESPN, the station chose not to broadcast Hasselhoff's performance. In 2015, he recorded the single "True Survivor", accompanied by a music video, which featured as the lead track for the 2015 Swedish short film Kung Fury. The song was composed by Mitch Murder (Johan Bengtsson). Recorded in Sweden, the song and the video is designed as an ostentatious over-the-top 1980s homage/parody, with the video featuring dinosaurs, kung fu, Adolf Hitler, skateboarding, Norse Gods and time travelling. Hasselhoff claimed that he had received the offer to record the song and the video by a request from Sweden Universal to "sing a tribute to the '80s". Hasselhoff performed a live version of the song during the 2016 Guldbagge Awards. Hasselhoff's autobiography Making Waves was released in the United Kingdom in September 2006. In an interview in April 2006, he promised the book would present the "last chapter" regarding controversial elements of his personal life. Since 2013 Hasselhoff has dated Hayley Roberts, from the town of Glynneath in Wales. He is a fan of Welsh rugby union, and they regularly attend rugby matches in Wales. In November 2015, Hasselhoff posted a YouTube video in which he announced that he had changed his name to "David Hoff". It was then reported that he was not changing his name; that the video was an excerpt from an upcoming advertising campaign. After touring Glasgow during late 2015, Hasselhoff stated that he supports Scottish football team Partick Thistle F.C.. He resides in Southern California with his two daughters, five dogs, and other pets. Hasselhoff was married to actress Catherine Hickland from March 24, 1984 to March 1, 1989. Their wedding was recreated in the Knight Rider Season 4 episode "The Scent of Roses" which first aired on January 3, 1986. Hasselhoff married actress Pamela Bach in December 1989. The couple have two daughters: Taylor Ann Hasselhoff, born May 5, 1990, who attended the University of Arizona and was cast for the 2015 season of Rich Kids of Beverly Hills, and actress Hayley Hasselhoff, born August 28, 1992. In January 2006, Hasselhoff announced he was filing for divorce, citing irreconcilable differences. Their divorce was finalized in August, 2006. Bach was given custody of one daughter and Hasselhoff custody of the other, until Hasselhoff later obtained custody of both. On May 3, 2007, a home video surfaced of Hasselhoff apparently in an alcoholic stupor. His daughter, Taylor Ann, who shot the video, can be heard saying, "Tell me you are going to stop, tell me you are going to stop." The daughter also warns her father he could be jeopardizing his spot on the Las Vegas production of The Producers. In the wake of the leaked clip, Hasselhoff issued a statement saying it was recorded by Taylor Ann so that he could see how he behaved while intoxicated and the footage was deliberately released. 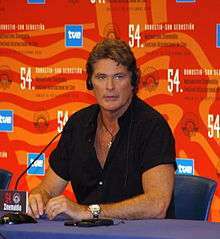 As a result of the video, Hasselhoff's visitation rights with his two daughters were suspended on May 7, 2007, for two weeks until the video's authenticity and distributor were determined. In May 2009, Hasselhoff's attorney, Mel Goldsman, described Hasselhoff as "a recovering alcoholic". Chris Moyles' Quiz Night The Hoff Series 4 – in every episode, as 'The Hoff' asking celebrities a question. 1 2 3 "David Hasselhoff Biography (1952-)". Filmreference.com. Archived from the original on March 4, 2016. Retrieved August 4, 2010. ↑ "New crab with hairy chest dubbed "The Hoff"". CBS News. January 5, 2012. Retrieved January 4, 2014. ↑ "Royal Wedding, Hugh Laurie and Johnny Depp lead record breakers of small and big screen in new Guinness World Records 2012 edition". September 14, 2011. Hugh Laurie has not been able to wrestle the all-time title from David Hasselhoff who remains the world's most watched man on television - ever. ↑ Highest reverse bungee jump: The highest height a human was catapulted using a reverse bungee system is 70 m (229 ft 7 in) by David Hasselhoff (USA) at Battersea Power Station, London, UK, on 30 June 2011. Cricket star Freddie Flintoff aiming for 12 world records in 12 hours for Sports Relief 15 March 2012: Freddie is hoping to break TV star David Hasselhoff's record for Highest reverse bungee jump, set in August 2011. 1 2 Hasselhoff, David; Thompson, Peter (2007). Making waves: The autobiography. Thomas Dunne Books. Retrieved January 4, 2014. ↑ "David Hasselhoff sucht deutsche Verwandtschaft – Der US-Amerikaner David Hasselhoff sucht in der Nähe von Kassel nach seinen deutschen Wurzeln". Klamm.de. Retrieved May 22, 2011. ↑ von der Wieden, Bianca (July 25, 2010). "SWR1 Leute überrascht David Hasselhoff mit Bremer Vorfahren" (in German). Presseportal. Retrieved December 22, 2010. ↑ Heller, Corinne. "OTRC: DAVID HASSELHOFF STARRING IN 'PETER PAN' IN UK, VISITS CHILDREN'S HOSPITAL BEFORE CHRISTMAS". ABC7.com. Retrieved June 23, 2015. ↑ "Notable Alumni, California Institute of the Arts". Calarts.edu. Archived from the original on January 5, 2008. Retrieved August 4, 2010. ↑ Moore, Alex. "A David Hasselhoff Story You Won't Hear on TV". Retrieved September 22, 2012. ↑ "9th Annual Favorite Male Performer...". People's Choice. Retrieved June 24, 2015. ↑ "Knight Rider Classic TV Show". NBC.com. Retrieved 24 June 2015. ↑ "Catching Wave Of Popularity: 'Baywatch' Seen in 140 Countries". chicago sun times. October 28, 1994. Retrieved September 22, 2012. ↑ "Former 'Baywatch' Hunk Hasselhoff Files for Divorce", ExtraTV.com, January 13, 2006. ↑ "David 'Hoff' Hasselhoff: through the years". telegraph.co.uk. Retrieved September 19, 2016. ↑ "Break Yo' TV: David Hasselhoff – "Jump In My Car"". Consequence of Sound. July 28, 2009. ↑ "Hasselhoff lands Producers role". BBC News. November 3, 2006. Retrieved April 1, 2010. ↑ "Howie Mandel To Replace Hasselhoff On 'America's Got Talent'". Access Hollywood. January 10, 2010. ↑ Millett, Eddie. "Live Blog: David Hasselhoff at The Cambridge Union". The Cambridge Student. Retrieved June 23, 2015. ↑ "Britain's Got Talent 2011: Michael McIntyre and David Hasselhoff join judging panel". Metro.co.uk. December 14, 2010. Retrieved May 22, 2011. ↑ Love, Matthew. "Every Comedy Central Roast from Worst to Best". Rolling Stone. Retrieved June 23, 2015. ↑ "Hasselhoff wins Bollywood honour". BBC NEWS. Retrieved June 23, 2015. ↑ "Celebrity Interview: David Hasselhoff LIVE". ABC 7 News. Retrieved June 23, 2015. ↑ "PlayStation Blog: A Very Special Message From David Hasselhoff". July 17, 2015. ↑ "When Aleksandr Met The Hoff – Listen Now!". Compare the Meerkat. November 11, 2009. Retrieved May 22, 2011. ↑ "Early day motion 1418 DAVID HASSELHOFF AND MORECAMBE WINTER GARDENS". UK Parliament Website. February 8, 2011. Retrieved June 19, 2015. ↑ "Comedy Central to Roast David Hasselhoff in New Special". TVGuide.com. Retrieved 2014-05-01. ↑ "David Hasselfhoff Returning to The Young and the Restless". TVGuide.com. Retrieved 2014-05-01. ↑ Rice, Lynette (August 30, 2010). "Aug 30 'Dancing With the Stars': season 11 celebrity dancers list". Hollywoodinsider.ew.com. Retrieved May 22, 2011. ↑ "David Hasselhoff Is A Flamboyant Captain Hook In 'Peter Pan' Production". starpulse. November 29, 2010. Retrieved September 22, 2012. ↑ "I can't wait to spend Christmas here': David Hasselhoff to appear as Captain Hook in panto to be close to Hayley". The Daily Mail. London. August 11, 2011. Retrieved September 22, 2012. ↑ "David As Hoff The Hook In Manchester". December 11, 2012. ↑ "Idol 2011 – David Hasselhoff Interview". Archived from the original on January 4, 2014. Retrieved September 22, 2012. ↑ kirby, Iona (September 1, 2011). "That's a bit of a Hassel! The red buzzer falls on the Hoff as judge is axed from Britain's Got Talent". The Daily Mail. London. Retrieved September 22, 2012. ↑ "Time to Get Hoff the Stage, David". London: The Sun. February 22, 2011. Retrieved July 29, 2011. ↑ "Hasselhoff: en svensk Talk Show". Archived from the original on October 11, 2014. Retrieved April 5, 2015. ↑ "David Hasselhoff Show". Sub (in Finnish). Retrieved April 3, 2015. ↑ "David Hasselhoff to Rock Berlin's Brandenburg Gate Again on Dec. 31". www.nbcnews.com. Retrieved January 1, 2015. ↑ "Liveticker zu Silvester: 2015 ist da - und David Hasselhoff trotz Fehllandung auch". Tages Spiegel. Retrieved 1 January 2015. ↑ "Silvester in Berlin: Party mit David Hasselhoff!". Deutsche Presse Agentur. January 1, 2015. Retrieved July 16, 2015. ↑ "David To Star in New Musical "Last Night a DJ Saved My Life"". DavidHasselhoffOnline.com. Retrieved June 23, 2015. ↑ "Get Hasselhoff to Number 1". Get Hasselhoff to Number 1. Retrieved January 20, 2012. ↑ "Fans hassle for new Hoff pop". Metro.co.uk. June 7, 2006. Retrieved May 22, 2011. ↑ "Campaign to get 'The Hoff' to number one". Daily Mail. London, UK. June 7, 2006. ↑ "Get Hasselhoff to Number 1!!!". RWDMag.com. June 7, 2006. Archived from the original on September 18, 2006. ↑ "Forum". Ynwa.tv. Archived from the original on July 15, 2006. Retrieved May 22, 2011. ↑ "BBC – Radio 1 – Scott Mills". BBC.co.uk. Retrieved May 22, 2011. ↑ "David Hasselhoff social networking site finally arrives". Pastemagazine.com. July 3, 2008. Retrieved May 22, 2011. ↑ "David Hasselhoff's social networking site is booming". Nowmagazine.co.uk. Retrieved May 22, 2011. ↑ "GETV: Don't Hassel the Hoff, David Hasselhoff". Geekentertainment.tv. August 11, 2008. Retrieved May 22, 2011. ↑ Elser, Daniela (December 8, 2010). "David Hasselhoff's Next Chapter – Reality Star". news.com.au. Retrieved December 22, 2010. ↑ "'Hasselhoffs' reality series to air on Bio". Digitalspy. May 16, 2011. Retrieved June 7, 2011. ↑ "Hasselhoff: 'The Hoff' Brand Dominates My Life: Video". Bloomberg. February 8, 2013. Retrieved January 4, 2014. ↑ "Hoff the Record, there's a brand new commission for Dave". UKTV. June 26, 2014. Retrieved January 1, 2015. 1 2 "David Hasselhoff German peak positions". IFPI Germany. Retrieved 2009-11-09. ↑ "Did David Hasselhoff really help end the Cold War?". BBC. 2004-02-06. Retrieved 2016-08-30. ↑ "How Mr. Hasselhoff Tore Down This Wall". NPR.org. Retrieved 2016-08-30. ↑ Hasselhoff, David (2006). Making Waves. Hodder & Stoughton Ltd. Retrieved July 16, 2015. ↑ "Oh Say Can You See the Hoff? ", TMZ.com, December 22, 2008. ↑ David Hasselhoff - True Survivor (from Kung Fury). YouTube. April 16, 2015. ↑ "David Hasselhoff Gives the Story Behind That Bonkers 'True Survivor' Music Video - Billboard". Billboard. ↑ "De uppträder på Guldbaggegalan". aftonbladet.se. Retrieved September 19, 2016. ↑ "Hasselhoff ready for Guldbaggegalan – Helsingborgs Dagblad". entertainmentbooksblog.blogspot.se. Retrieved September 19, 2016. ↑ Rushton, Katherine (April 15, 2006). "Who Is the Hoff? Actor-Turned-Memoirist David Hasselhoff: "I AM SUPERMAN, and I can go ANYWHERE!"". The Book Standard. Nielsen Business Media, Inc. Archived from the original on May 25, 2007. ↑ "David Hasselhoff spotted in disguise at Wales rugby game". BBC News. Retrieved 2015-11-13. ↑ Kathryn Williams (April 24, 2015). "David Hasselhoff's Welsh girlfriend Hayley Roberts on living and loving a legend". walesonline. ↑ "Autumn Internationals: David Hasselhoff's advice for Wales". BBC Sport. Retrieved 2015-11-13. ↑ "Greatest clash of the rugby rivals". Telegraph.co.uk. September 26, 2015. ↑ "Hoff with the Hassel! David Hasselhoff Claims He Has Changed His Name to David Hoff". People (magazine). ↑ "Did David Hasselhoff Really Change His Name to David Hoff?!". Us Weekly. November 13, 2015. ↑ "The Hoff: American actor explains Partick Thistle support". December 23, 2015. Retrieved September 19, 2016 – via www.bbc.co.uk. ↑ Hinckley, David. "The Hoff is no Knight Rider in A&E reality show". NY Daily News. Retrieved June 23, 2015. 1 2 Silverman, Stephen M. (January 13, 2006). "David Hasselhoff Files for Divorce". People. Retrieved May 3, 2016. ↑ "The Birth of Taylor Hasselhoff". CaliforniaBirthIndex.org. Archived from the original on March 4, 2016. Retrieved July 16, 2015. ↑ "The Birth of Hayley Hasselhoff". CaliforniaBirthIndex.org. Archived from the original on March 4, 2016. Retrieved April 15, 2014. 1 2 "Ex-Attorney Sues Pamela Bach". The Washington Post. Associated Press. August 24, 2007. Archived from the original on May 3, 2016. Retrieved July 22, 2012. Bach replaced [attorney Debra A]. Opri with Mark Vincent Kaplan several days after losing custody of the couple's two teenage daughters. ↑ "Hasselhoff 'violent' claims wife". BBC News. March 9, 2006. Archived from the original on March 23, 2016. Retrieved May 3, 2016. ↑ ""Drunk Tape Bad for Hasselhoff, but Is It Worse for His Daughter?" on ABC". Abcnews.go.com. May 4, 2007. Retrieved May 22, 2011. ↑ "Hasselhoff 'too drunk' to board plane", inthenews.co.uk, July 27, 2006. ↑ "Publicist: Hasselhoff Was Sick, Not Drunk". The Washington Post. Associated Press. July 27, 2006. Retrieved June 19, 2015. ↑ AP, "Hasselhoff's visitation rights suspended", USA Today, 2007-05-03; retrieved June 30, 2007. ↑ Fisher, Luchina (May 5, 2009). "David Hasselhoff's Fall From A-List to Addiction". ABC News. Archived from the original on May 3, 2016. Retrieved May 3, 2016. ↑ "Hasselhoff stars in Keith Lemon: The Film", BBC News, 2007-05-03, Retrieved on February 26, 2012. ↑ "Hoff the Record, there's a brand new commission for Dave". UKTV. Retrieved August 15, 2014. ↑ "David Hasselhoff saa oman keskusteluohjelman Suomeen". nyt.fi. Helsingin Sanomat. Retrieved March 8, 2015. ↑ "I'm Looking for...The Best Oceanian and some European Charts". IFPI Switzerland. Retrieved November 9, 2009. ↑ "Lovin' Feelings Oceanian and some European Charts". IFPI Switzerland. Retrieved November 9, 2009. ↑ "Night Rocker Oceanian and some European Charts". IFPI Switzerland. Retrieved November 9, 2009. ↑ "Sings America Oceanian and some European Charts". IFPI Switzerland. Retrieved November 9, 2009. ↑ "Crazy for You Oceanian and some European Charts". IFPI Switzerland. Retrieved November 9, 2009. ↑ "David Oceanian and some European Charts". IFPI Switzerland. Retrieved November 9, 2009. ↑ "Du Oceanian and some European Charts". IFPI Switzerland. Retrieved November 9, 2009. ↑ "Everybody Sunshine Oceanian and some European Charts". IFPI Switzerland. Retrieved November 9, 2009. ↑ "Hooked On A Feeling Oceanian and some European Charts". IFPI Switzerland. Retrieved November 9, 2009. ↑ "Knight Lover Oceanian and some European Charts". IFPI Switzerland. Retrieved November 9, 2009. ↑ "Looking for Freedom Oceanian and some European Charts". IFPI Switzerland. Retrieved November 9, 2009. ↑ "You Are Everything Oceanian and some European Charts". IFPI Switzerland. Retrieved November 9, 2009. ↑ "David Hasselhoff German Charts". IFPI Germany. Retrieved November 9, 2009. ↑ "Freedom for the World Oceanian and some European Charts". IFPI Switzerland. Retrieved 2009-11-09. 1 2 "Gipsy Girl Oceanian and some European Charts". IFPI Switzerland. Retrieved 2009-11-09. ↑ "Hands Up For Rock 'n' Roll Oceanian and some European Charts". IFPI Switzerland. Retrieved 2009-11-09. ↑ "Hooked On A Feeling Oceanian and some European Charts". IFPI Switzerland. Retrieved 2009-11-09. ↑ "Jump In My Car Oceanian and some European Charts". IFPI Switzerland. Retrieved 2009-11-09. ↑ "Crazy for You Oceanian and some European Charts". IFPI Switzerland. Retrieved 2009-11-09. ↑ "Do The Limbo Dance Oceanian and some European Charts". IFPI Switzerland. Retrieved 2009-11-09. ↑ "Everybody Sunshine Dance Oceanian and some European Charts". IFPI Switzerland. Retrieved 2009-11-09. ↑ "Is Everybody Happy Dance Oceanian and some European Charts". IFPI Switzerland. Retrieved 2009-11-09. ↑ "Looking for Freedom Oceanian and some European Charts". IFPI Switzerland. Retrieved 2009-11-09. ↑ "Our First Night Together Oceanian and some European Charts". IFPI Switzerland. Retrieved 2009-11-09. ↑ "Wir Zwei Allein Oceanian and some European Charts". IFPI Switzerland. Retrieved 2009-11-09. ↑ "David Hasselhoff on Chart Stats". Chart Stats. Retrieved 2009-11-09. ↑ "David Hasselhoff - True Survivor". Retrieved July 28, 2015. Q&A, The Guardian, April 11, 2009.